As the winter weather stirs our Walnut Wednesday wishes and food truck fantasies, Gary Mazurowski and his team are toiling away on the latest addition to the city’s rolling restaurant fleet. 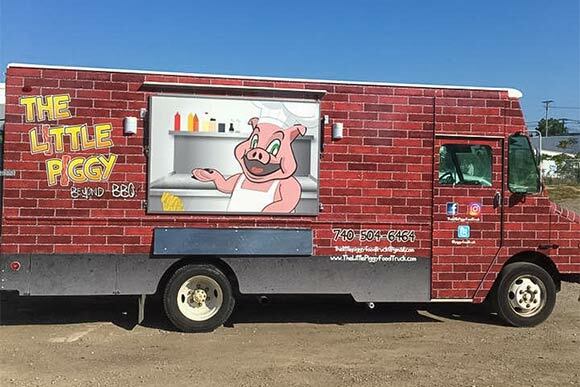 Tucked away in an industrial strip behind Target between West 117th Street and Berea Road is Cleveland Custom Trucks - the city’s de facto food truck fabrication and repair facility after its sole competitor shuttered earlier this year. When Mazurowski first rented the space back in 1996, it was to open a landscaping company with a partner. When the duo parted ways, the business evolved into a concrete company. Then, in what he calls a “midlife crisis” moment brought on by backbreaking labor, Mazurowski was driven to do something radically different. He enrolled in culinary classes at Gatherings Kitchen in Lakewood to hone his culinary skills and planned to split his time selling barbecue and tearing out concrete. “It took five months to build [the first food truck], and I thought, ‘You know, I’m probably a better builder than I am a chef,’ and I put it on eBay. It sold in less than three hours for $39,000,” recalls Mazurowski. Though the winning bidder was an out-of-towner, three or four investors in Cleveland also expressed interest. Now some 75 trucks later, Mazurowski has yet to create a truck that wasn’t sold before the job began. In as little as six weeks, the crew can turn around a new-build while juggling service requests for repairs, often referred by the city of Cleveland and other clients. From The Wandering Wardrobe to Wok N Roll, Cleveland Custom Trucks has made and mended a variety of mobile venues ranging from vans to a sleek shipping container turned showroom for the Downtown Cleveland Alliance that was once stationed behind the Rock & Roll Hall of Fame. 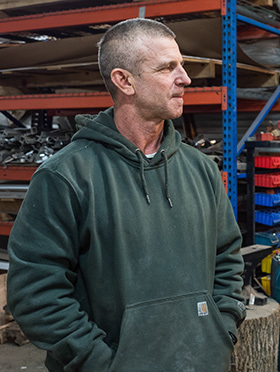 Cleveland Custom Trucks’ booming business enables Mazurowski to spend his time on less lucrative projects with ornamental iron – an art form he’s been passionate about for more than a decade. His work at Adorning Metal has been featured in Tremont galleries and is also installed inside the popular Kamms Corners haunt, West Park Station, for which he created an intricate entry archway. Though reasonable rents haven’t changed since he moved into the bare-bones space 20 years ago, adding heating a few years back generated natural gas bills that surpassed $600 a month. Thinking there had to be a better way, the hands-on DIY man built a double barrel burner, which typically radiates heat, and retrofitted it with fans to circulate the warm air through the shop. “I chop wood all summer, which I love doing, and then I have heat all winter for less than $75 bucks a month,” Mazurowski says with a grin. His ax-wielding enthusiasm is in part thanks to an athleticism that belies his age. The craftsman recalls consciously trading one addiction for another while kicking cigarettes eight years ago. “I said, ‘I either gotta start running or I’m gonna start eating.’” Within a few years’ time, he joined 45,000 people to run the Chicago marathon. “Once you do one you want to do them all." Soon enough, however, clocking off terrestrial miles wasn't enough. "Running gets boring after a while," says Mazurowski, "so I was like, ‘What’s this triathlon stuff?’’ He decided to find out by heading to the pool at the Brookpark Recreation Center. Within a month, Mazurowski was swimming a mile in under an hour, all the while being outpaced by the “old man” in the adjacent lane. Even cold Cleveland winters don’t break Mazurowski's stride, the hard-core amateur athlete merely swaps his sneakers for spiked soles before hitting the iced-over pavement for his morning run. Already anticipating the 2017 race season, he plans to compete in the Cleveland marathon and triathlon and his third IRONMAN in Chattanooga. As his MIG welder whirrs, a masked Mazurowski is enveloped in a halo of sparks. Curious projects beckon amid the sounds filling the shop, one of which bears an uncanny similarity to sizzling bacon. His latest custom creation, the Nawlins City Express, holds court in one of the bays. Peering into its oversized window that will soon give waiting foodies a glorious view of what's cookin' inside, one can almost taste the Big Easy-inspired beignets that will be made to order come springtime.